King Solomon is well known for his devotion to justice for a long and prosperous life blessed by God, as we see in Proverbs 11:11 and many similar verses: ‘by the blessing of the just shall the city prosper.” That’s especially true for the wealthy and people in power, who, Solomon says, are especially obligated to deal fairly with the less fortunate. Now, a new bill being drafted by House Republicans aims to rein in government involvement in housing issues and, its backers say, restore balance to a housing policy usually dominated by the government. They claim this “holistic” approach will support the housing recovery and break what they see as a virtual government monopoly on financing housing. According to a new report from Mortgage News Daily, the proposed legislation, sponsored by members of the House Financial Services Committee, would completely phase out government backed lenders Fannie Mae and Freddie Mac, and replace the with a nonprofit securities package. That proposal would override current plans to create a third entity out of parts of Fannie and Freddie to handle securities and bonds. Other provisions in the bill, which is now only in draft form, include planes to pare down the government’s direct involvement in housing finance to loaning only through the Federal Housing Administration (FHA). What’s more, the new plan, which claims to benefit first time and lower income home buyers, would raise the minimum down payment for an FHA loan to 5 percent of a home’s total purchase price. The housing bill’s sponsors, led by Texas Republican Jeb henserling, who chairs the Finance; Services Committee, call it a “holistic” approach to housing finance that would keep support programs from losing money and break what they see as a virtual federal monopoly on housing support. They cite the troubled history of Fannie Mae and Freddie Mac, which nearly collapsed after the housing crisis of 2008, and losses racked up by the FHA as reasons for revamping the whole system. But critics fear that by raising the minimum down payment required for FHA loans and eliminating some if not all of the government backed financing and refinancing programs, the bill could shut out some potential home buyers and slow down the housing recovery. And, because it also delays implementation of the Qualified Mortgage Rule, which sets fairly stringent standards for mortgage applicants, it could allow more risky loans to slip through. Swanson, Jann. 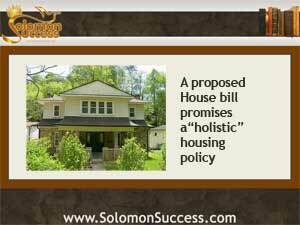 “Republicans’ ‘Holistic’ Bill to End Most Government Mortgage Support.” Mortgage News Daily, 12 Jul 2013.